Gabon’s human rights record is by all accounts truly horrific. The situation of children is far from ideal, and the difficulties they must face are often cruel. Children’s rights—as those rights pertaining to healthcare, education, labor, etc.—are constantly being violated. In Gabon, more than 33% of the population lives below the poverty line. Rural areas are especially hard hit, and children are the most vulnerable. The children of poor families must also confront problems as prostitution, HIV and premature pregnancies. In Gabon, it is frequently the case that young girls’ parents see to it that they are married very early on. The legal age of marriage for women is 15—which explains the high rate of marriage among young girls: around 34%. These marriages often have serious consequences for the young girls in question who do not understand what such marriages entail. 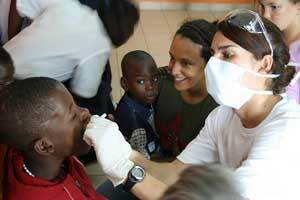 More than 69 % of Gabon’s children die before the age of 5. Moreover, around 2.9 % of the population is infected with HIV. HIV/AIDS affects children who are the victims of abuse as well as those born to HIV-positive mothers. Indeed, the utter lack of information concerning the transmission of the virus from mother to infant has prompted the Health Ministry to react. In order to limit the risks relating to the transmission of AIDS, it has undertaken an awareness-raising campaign aimed at pregnant mothers. Gabon’s infant mortality rate is one of the highest in the world. The principal causes include malaria, measles, diarrhea, malnutrition and AIDS. Economic development, combined with the promotion of healthy living, along with programs aimed at fighting poverty, is the only real way of decreasing the infant mortality rate. Despite the country’s economic plight, 94% of Gabonese youth are educated. 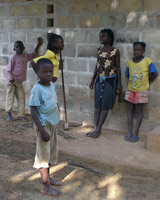 Poverty affects certain parts of Gabon where access to education is often difficult. In effect, poverty is mostly present in villages. Villages affected by poverty also suffer from a lack of educational infrastructure. It is often the case that children attend boarding schools and live far away from their families. Although education itself is free, each person is subject to an array of fees that come to about 50 dollars. Poor families are often incapable of paying these fees—which prevents their children from attending school. Uneducated children are often forced to work. 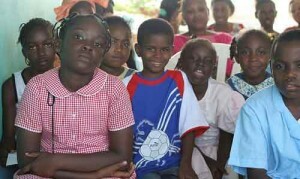 A 2011 study has revealed that 77% of Gabonese children were the victims of violence. Moreover, the violence in question is widespread. It occurs within the family, at school and in the community more generally. The violence to which children are subjected takes a variety of forms—moral, psychological, physical, sexual. Physical violence expresses itself via cultural biases and traditional practices. In effect, certain children are subjected to violence via practices involving bodily mutilation (excision, scarification) or through dictatorship by law of primogeniture. Another form of violence to which children in Gabon fall victim, is ritual murder. In Gabon, children’s right to life is not always respected—which violates Article 6 of the International Convention of Children’s Rights. The ritual murder of Gabonese children is perhaps the most egregious example of this. Such killings are carried out for the purpose of gaining access to the victim’s organs. Some children are more vulnerable than others. Poor children are the primary victims of this practice. There have been reports where parents have exchanged the life of their child for money. Purchasers of the child tend to make the murders look like accidents so as to avoid being punished. On account of poverty, certain families are forced to send their children to work. Children thus become a means by which families are able to make more money and support their needs. In general, young girls, who tend to be uneducated, become domestic servants.While some employers may treat them in the “correct” manner, others abuse and exploit them. As for the boys, they often work in the agricultural sector. There, working conditions are far from ideal and can be extremely hazardous to their health. Poisonous chemicals, lack of hydration and sometimes outright slavery are some of the factors that make such labor dangerous. 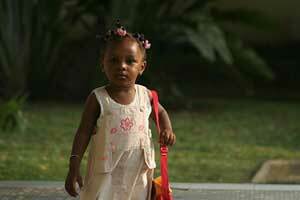 In addition to being forced to work at a very young age, Gabonese children also fall prey to human traffickers. Children are recruited to work in their own country, but sometimes they are sent abroad to other African countries. From then on, they are at the mercy of their employers and, lacking both the strength and education to resist, have no choice but to obey their masters. Their parents, meanwhile, have no idea what is happening and think that the traffickers are improving their children’s lot in life—which is why they sent their offspring to such individuals in the first place. Girls are also the victims of child-trafficking. The situation must change if children’s rights to liberty and education are to be respected. 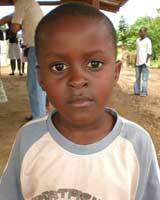 In Gabon, citizenship is conferred upon a child if the nationality of one of his or her parents is Gabonese, and not simply because he or she is born in the country. Only 89% of all births are officially registered with the proper authorities, despite such a policy being mandatory. Those children whose births are not officially registered invariably suffer for it. They are denied access to school, as well as to any program sponsored by the government. Such children do not officially exist in the eyes of society and are unable to enjoy their rights.